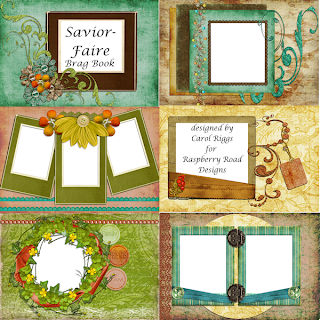 A new brag book featuring Raspberry Road Designs Savior-Faire kit has just been posted on her blog . I had lots of fun designing this book. I love the colors. I hope you will swing by Raspberry Road and pick up the freebie. As always, comments are welcomed! What a gorgeous brag book! Awesome job! What a pretty brag book! Nice work! How Pretty! Thanks for the link! What a pretty brag book, and how very generous of a giveaway! I'm glad I stopped by your bloggie! Carol, I just LOVE these!! I'm off to get them now! What a beautiful brag book - I will definitely go to Susan's site and pick this one up! Thanks so much for sharing - you make the most gorgeous brag book pages and quick pages.